We are cruel to our hyacinths when we grow this hardy plant indoors. We force it to grow out of season in unnaturally high temperatures without proper drainage on a table away from the window. Worse when we let it die down. None gardeners throw it outside, roots exposed, into a dark corner on a freezing February day. The emphasis in ‘die down’ seems to be 'die'. Perhaps if we want them to flower next year we should rename the process 'live down'. Indeed when I tried to find a suitable word in the botany books to encapsulate the concept of leaves photosynthesising, eventually senescing and storing food in a vegetive organ there were none! Indoor hyacinths when finished flowering should be placed in a bright outdoor situation - even better in a cold greenhouse - to continue their life cycle. It is not just a matter for the feeble remaining stored resources to translocate down to the developing new bulb. Green leaves need to work to manufacture new nourishing sugars. They need to be watered and even liquid fed. It might be late May before the leaves naturally turn yellow and shrivel. If you don't do these things you might just as well throw your old plants in the bin! 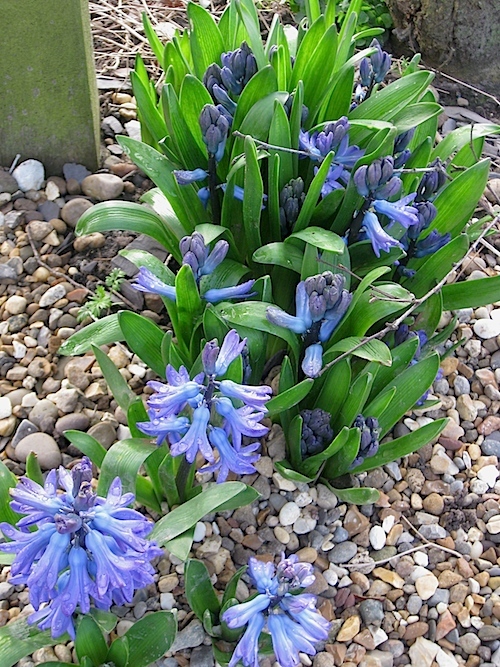 It will take a few years for your hyacinths return to their former glory but most of us like to take on the challenge! Get your order in early and plant new bulbs directly outside in August. It can be as late as October but the sooner the better. 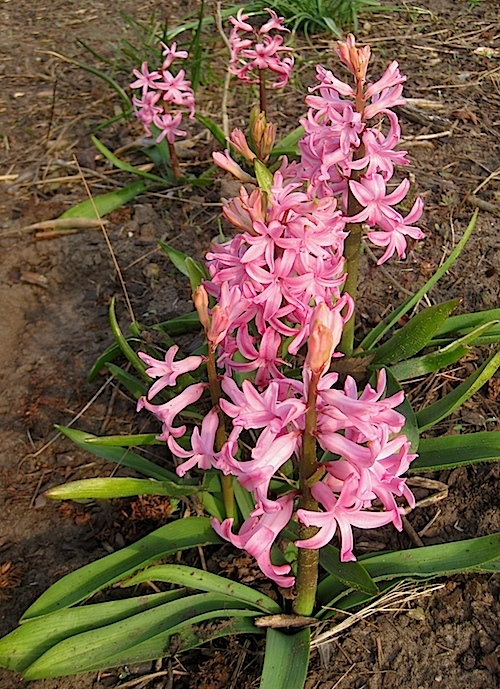 Do not buy expensive 'treated' hyacinths, you are not going to force them. Top size is ostentatious, just get ordinary firm fat ones. You need to plant them in clear soil. Unlike daffodils, snowdrops, Fritillaria meleagris and crocus, hyacinths do not have the constitution to naturalise in grass. Plant as deep as their size. Don't be too fussy and if they are not completely upright or at a precise depth it does not really matter. As a none digger I don't make a hole but merely scoop with my spade and pop the bulb under the raised soil. I have never yet used a bulb planter and don’t intend to do so. Don't bother to try and improve drainage by placing gravel at the base of a hole as is frequently recommended. It is a complete waste of time. I hope you do not dig your borders or you will lose your future bulbs when dormant when you shred them. Unless your soil is really fertile and well drained the flowers might not be as big in future years as in the first one but they will grow into healthy and arguably daintier clumps. I have been adding a few extra bulbs for several years and they are littered all over my borders. They get no special attention other than freedom from weed, an open position and chance to naturally die down. Each clump gets bigger every year. The same rules apply to when growing in the ground. You have the advantage of enjoying the flowers in a temporary display but their early growth and dying down period can take place in a light propagation area. In pots and containers unlike in the ground, it is necessary to liquid feed or top dress with fertiliser to compensate for nutrients lost by leaching. Unlike in open soil, you need to give keen attention to watering. It is very important to realise that on a dry windy late winter day substantial dehydration will occur when your plants have become leafy. 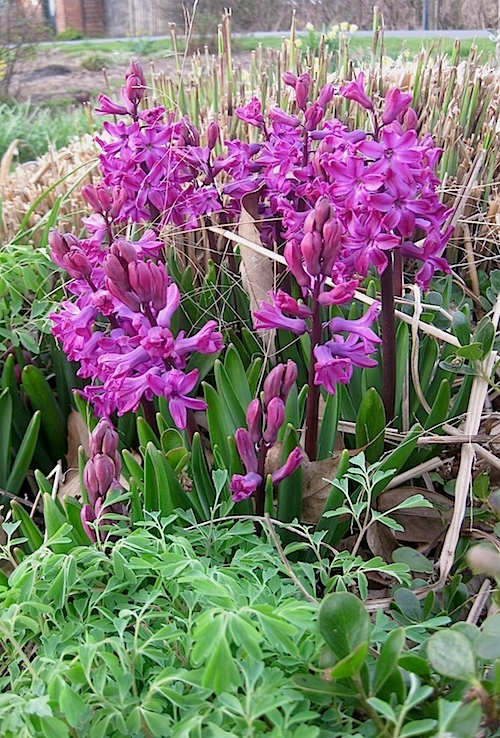 I usually find that I cannot recycle tubs of hyacinths more than three or four years. They get crowded, unbalanced, weaker and some bulbs might even die. I start again and any remaining bulbs are popped into the ground. Some of you will remember this lady played by Patricia Routledge in the TV series 'Keeping up Appearances'. She has been in my mind as I wrote this piece and in her honour I spelt Hyacinth in the title with a capital H! Like indoor hyacinths she started from humble beginnings and married to higher status and became an hilarious snob. Many folk start their hyacinths in a cold cupboard - not really recommended - better to start in the cold outside. 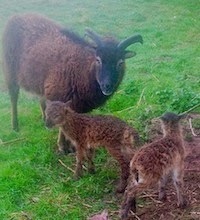 Brought inside they are 'forced' in warmer conditions. 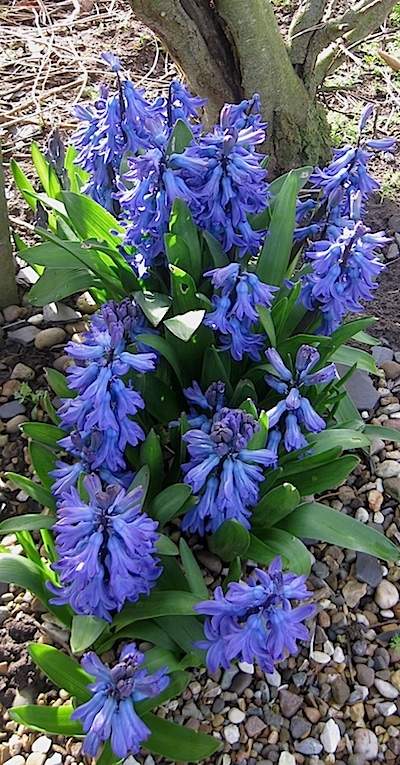 Like Hyacinth Bucket they are very heavily perfumed and if the scent was not so gorgeous you might think it sickly. Like Hyacinth, hyacinths are 'loud', plump and flamboyant rather than delicate, elegant and retiring. 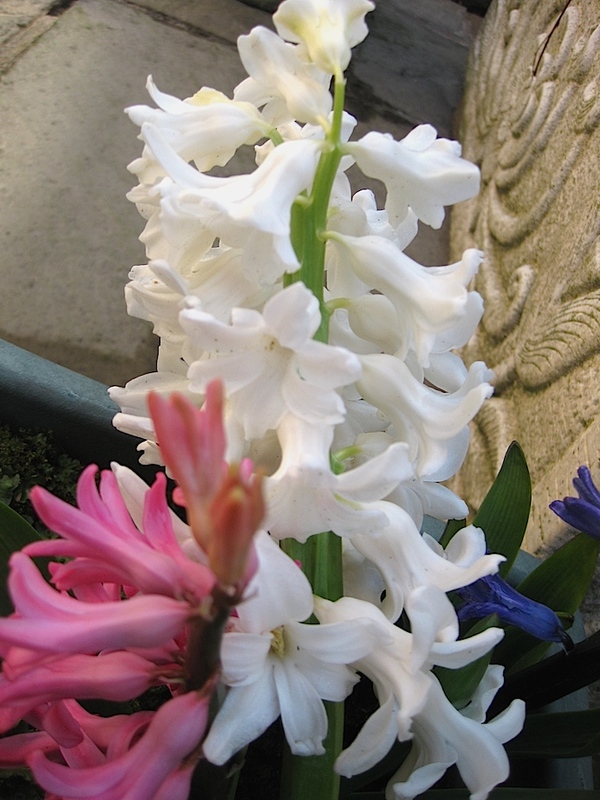 Indoor hyacinths are frequently grown in a 'bucket' - well usually a shallow undrained container. 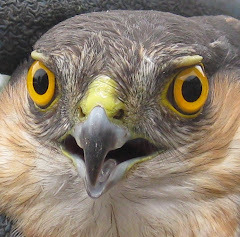 I disapprove. Hyacinth would not want water to drain on her elegant furniture. Only posh Hyacinth would insist on growing hyacinths in 'upmarket' bulb fibre - a really 'common' practice! Your indoor hyacinths are best grown in ordinary compost in normal drained pots with an outer container to catch the water. I wonder if Hyacinth would deign to empty out surplus water. She would perhaps wait for her servant. Brenda chastises me when she does the same for me at home. Hyacinth Bucket is a very ‘pushy’ lady. Here my overwintered dahlia seems to be doing the pushing. Is this inspired planting or just a happy accident? 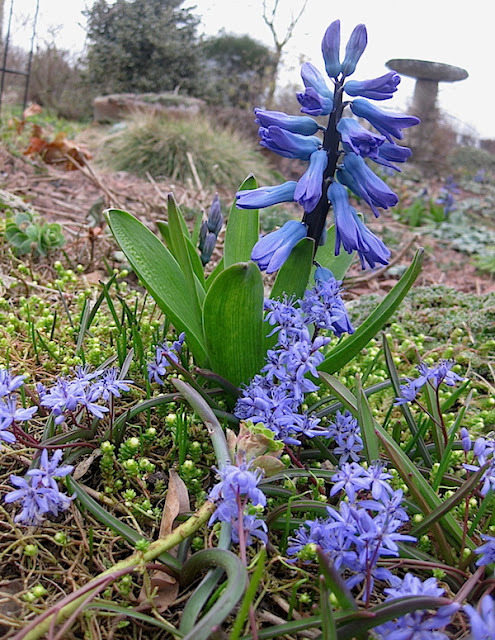 I let my hyacinths die down naturally without cutting back. My policy is to just let them fade away as early summer plants take over. Another accident too far? Common advice across the pond is that hyacinths in the ground get smaller each year and after a couple of years disappear. It is the reason i never bothered with them. I have a few now for several years and they they come back just fine. I have not noticed them dividing by bulbs or seeding - but they do come back. I planted more last year to see if I can increase numbers. I think my pictures show that some of my hyacinths that have been in for ten years do not get smaller Robert. It's tidy gardeners that are the culprits - they just have this passion to cut things back. I visited a very nice garden yesterday and I noticed the lady had cut what must have been a late flowering daffodil hard to the ground (late flowerers are also later cutterbackerers) Many times "yuk"! Last week I was rather apoplectic when the man Cathi-next-door pays to cut the grass took the lawn mower over still green daffodils! My hyacinths are never touched as they die down and they get plenty of sunshine. In another week they will have completely shrivelled. Amazing collection of pictures, mate. Your post surely goes in my bookmarks tab. Anyway, I think you are right about hyacinths. This plant is not suitable for inexperienced gardeners or beginners. It needs a delicate approach and surely the indoor growing makes things worse. Flattery will get you everywhere Ryan - even sneaking an ad in! I always think forced hyacinths like forced rhubarb look weak and unhappy. I never had trouble growing them inside or outside. If inside, I transfer them back to the garden in spring to live their life outdoors. I think they are an easy bulb to grow, but maybe it is because I have been just doing if for too many years. They naturalize in my heavy clay too and each year are quite lovely. I like them a lot and have quite a few. Good tips though for the inexperienced. Good to hear it does well on heavy clay. One of my reservations is that it might not naturalise where the drainage is poor - not that I would suggest that is your case Donna, I have read your blog and know how important you consider good drainage. Also good to hear of your success when they come out of the house. I am encouraged that the ones I mentioned to Sue Garrett which have had Rolls Royce treatment will flower well outside next year! I wonder if they ever seed? Perhaps a reader will tell us. I'm going to consider my hands well and truly slapped now. I only buy hyacinths in pots when they're about to bloom as the scent which wafts around the house is heavenly, afterwards I discard them. I'm a bad gardener, I know. I think it is very practical to discard them rather than spend time saving them. It's only meanies like me that keep them. When we visited the bulb park At Keukenhof in Holland we were told that they plant about 15 million bulbs every year and one of the gardeners told us that when the garden closed for the Summer they are all dug up and thrown away! Sorry Roger, no matter how good you make your Hyacinths look, and they do look attractive, I have never taken to them and never will, remind me too much of formal bedding schemes, I think is possibly a phobia. To a degree I share your phobia. Perhaps it was a kind of defence to relate them to Mrs. Bucket. I tend to think of some of mine as rather wasted as they are flowering among scruffy debris and there is not much plant background. I am starting a little trial on the perimeter of my garden where my garden has edged into the farm field. It will be patches of fine grass with plants growing in spaces in between. I think a few hyacinths might look quite nice there!